McFadden Engineering was retained by Rich’s Car Wash to assist them with the design and construction of a car wash facility off Airport Boulevard in west Mobile, Alabama. McFadden Engineering assisted Rich’s with site design and layout, grading and drainage design, and design of a water treatment facility that would allow the facility to re-use water in the car wash or discharge the treated waters from the wash facility to nearby Milkhouse Creek. McFadden also handled all permitting through the city of Mobile, the construction stormwater permitting with the Alabama Department of Environmental Management (ADEM), and the discharge permitting for the water treatment facility through ADEM. 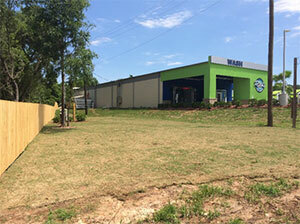 The state-of-the-art car wash facility includes a self-service prep area, a tunnel wash, a detail area and a vacuum area. The site development consisted of major site work to compensate for a 10-foot elevation drop between the existing facility and new property. Because of the site’s proximity to Milkhouse Creek, the site had to be modeled for its potential impacts on the 100-year floodplain. McFadden Engineering modeled the improvements using the U.S. Army Corps of Engineers HEC-RAS software and was able to show negligible impacts in the floodplain from the development. A “No-Rise Certification” was approved for the development because of this modeling effort, and construction of the wash could begin. Site drainage was routed to an existing detention facility since the site was an outparcel of a larger development. McFadden Engineering assisted Rich’s with coordination of utilities for the new site with local utility companies and assisted the site contractor with ADEM permit compliance and implementation of erosion control measures to protect Milkhouse Creek from stormwater runoff. McFadden Engineering also assisted Rich’s with the design, permitting and implementation of an OxyShark® treatment system to allow the wash facility to reuse and/or discharge the water off the sewer grid (i.e., stream discharge to Milkhouse Creek). By using the OxyShark® treatment system, Rich’s could be more profitable while greatly reducing or eliminating the need to use the municipal sewer system. The OxyShark® system at Rich’s is designed to handle the specific needs of the site, which has a maximum hydraulic flow rate of 20,000 gallons per day and a wastewater strength of about 140 mg/l BOD5. In addition, McFadden Engineering is assisting Rich’s Car Wash with effluent and stream monitoring testing related to its agreement with city of Mobile to allow discharge of the water to stream within the city’s MS4 system and is also handling permit compliance with ADEM.